SAN FRANCISCO, CA--(Marketwired - Sep 30, 2015) - Midokura, the global innovator in software network virtualization, today announced its appointment of Pino de Candia as chief technology officer (CTO). 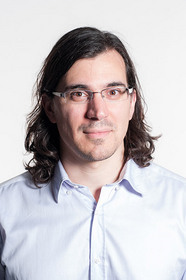 Formerly chief architect at Midokura, de Candia will take over the CTO role from Dan Mihai Dumitriu, who will remain as the company's CEO. As CTO, de Candia is responsible for Midokura's technical innovation and the evolution of its flagship technology MidoNet, the award-winning scalable network virtualization solution designed for Infrastructure as a Service (IaaS) clouds. Midokura offers an enterprise version, Midokura Enterprise MidoNet (MEM), and an open source version as well. De Candia joined Midokura shortly after its founding in 2010, and has since made tremendous contributions to the MidoNet technology. Prior to Midokura, he served as software development engineer at Amazon.com, where he built Dynamo, a NoSQL data store for Amazon's shopping cart, and managed the caching team in Amazon's Website Application Platform. De Candia earned his Bachelor of Science and Masters of Engineering in computer science at Cornell University. "I am thrilled to pass the role of CTO on to my longtime friend and collaborator Pino de Candia," said Dan Mihai Dumitriu, CEO of Midokura. "Since joining the Midokura team in our early days, Pino has proven essential to our product development and continued overall company success. With his impressive leadership and exceptional distributed systems background, Pino will help further our commitment to advancing networking in OpenStack clouds and beyond." Today, high profile security breaches continue to make news headlines and elevate data center security to board-level concern. Now more than ever, the need for organizations to implement proper network security within OpenStack is vital to the project's continued success. Companies of all sizes are tackling this challenge by introducing concepts and products related to the micro-segmentation of networks, which, in some proprietary infrastructure contexts, rely heavily on network virtualization platforms. "Midokura is in a prime position to solve the networking problems of OpenStack, including adding advanced security and service chaining functionality in order to address growing customer and market demands," said Pino de Candia, newly appointed CTO of Midokura. "I am honored to take on this role at such a critical time, and I look forward to further advancing Midokura's technology and innovation in the network virtualization space." The MEM technology combines the most stable, production-hardened version of MidoNet for network virtualization with MidoNet Manager, big data analytics, longer-term support and enterprise-class 24/7 service level agreement. The open source version of MidoNet is quickly gaining in popularity around the globe by organizations of all sizes. The MidoNet platform provides a software layer directly within existing physical network hardware, turning physical machines into a virtual platform that can scale to hundreds of thousands of virtual ports. To learn more about MEM, please visit: www.midokura.com/midonet-enterprise. To learn more about open source MidoNet, please visit: www.midonet.org. Founded in 2010, Midokura was an early global leader in network virtualization. The company's pedigree includes Amazon, Cisco, Google and VMware. With its Midokura Enterprise MidoNet (MEM) solution, Midokura offers the industry a complete overlay technology that integrates with cloud platforms, such as OpenStack. Now gaining awareness in 122+ countries, the source code for MidoNet is freely available at www.midonet.org. MidoNet delivers the first truly open, vendor-agnostic network virtualization solution available to the OpenStack community. Midokura is a contributing member of the OpenStack Networking (Neutron) Project, Open Platform for NFV Project and the Open Container Initiative.